One Level Living in the perfect location, convenient to all of Greenville! 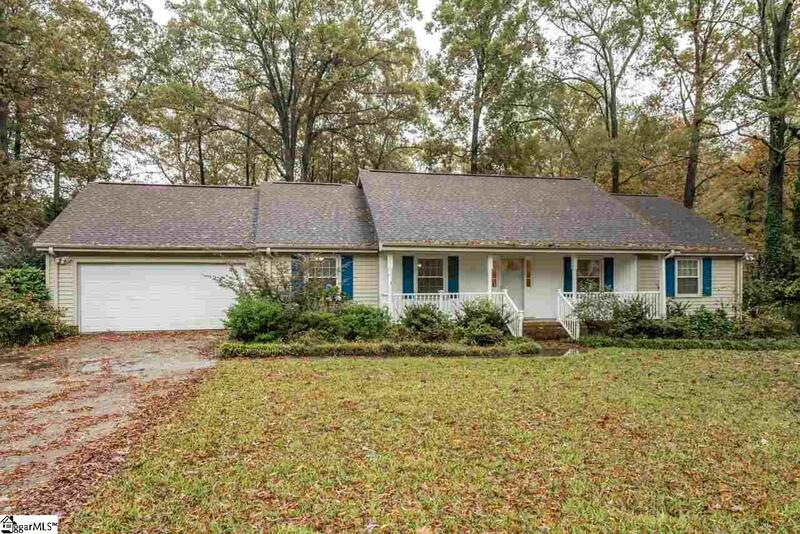 With 4 bedrooms and 3 full bathrooms, a living room, den, dining room & sunroom, the options are abound with this home! So much space and so many ways you can layout your floor plan, great for any lifestyle. Get creative and design your dream home or just do a little updating, the choice is yours. The yard is a park-like setting with lot's of privacy, fully fenced, and a large patio, even a large outbuilding with power. The sunroom and master addition off of the back of the home are very spacious and overlook the gardens. The kitchen has white cabinets and gleaming hardwood floors, showcasing a nice breakfast room, complete with built-in shelves. The laundry/mudroom area is large and has a separate sink and full bathroom for guests as well as a big pantry for the Chef. The living room has nice gas logs and is just off the sunroom, great for entertaining. The garage has a workshop which could also be great storage. You truly must see this house because the pictures just don't tell the story! The neighborhood has a community pool, playground, and is located in an established sought after location. Listing provided courtesy of Kiersten Bell of Coldwell Banker Caine/Williams.